KUALA LUMPUR: Actor Hani Mohsin Hanafi (pic, right), 43, died of a heart attack after collapsing at the AirAsia counter at the Low Cost Carrier Terminal yesterday. The host of the popular Roda Impian (Wheel of Fortune) series over Astro was to take a flight back to his hometown in Kangar in Perlis when he collapsed at 10am. 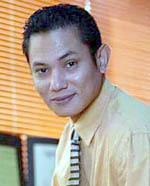 He was with his 10-year-old daughter Hani Karmila from his previous marriage to actress Datin Seri Tiara Jacquelina. Airport staff attended to him before rushing him to the nearby Pusat Rawatan Islam clinic. He was pronounced dead at the clinic. 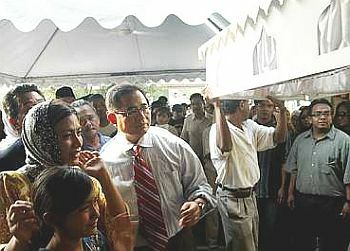 Hani’s body was sent to the Serdang Hospital for a post mortem and later taken to his house at Taman Kelab Ukay, Bukit Antarabangsa, in Hulu Kelang. His relatives from Perlis rushed to Kuala Lumpur upon hearing of his death. Tiara and her present husband Minister in the Prime Minister’s Department Datuk Seri Mohd Effendi Norwawi were at the hospital. They accompanied Hani’s body to the house at 4.50pm. According to Tiara, Hani never complained to her about any illness or told her of any medical problem. “I’m in shock because he had so much life in him. We still see each other as friends and discuss work matters,” she said at Hani’s house. Tiara said she was about to go for a rehearsal for her Puteri Gunung Ledang theatre show at Istana Budaya when Hani Karmila called her. “My daughter was crying, saying, “Mummy, ayah dah tak ada lagi (Father has passed away),” she said with tears in her eyes. Hani’s uncle, who declined to be identified, said Hani had complained to him of stress. He said Hani told him about a year ago that he had breathing difficulties. He added that Hani had lost his appetite and looked weak during the past week. “He told me to take care of his child if anything happened to him,” he said. SHOCKED CROWD: Hani’s body being brought to his house at Taman Kelab Ukay, Bukit Antarabangsa in Hulu Kelang. At left are Tiara, her husband Mohd Effendi, and Hani Karmila. About 200 friends and relatives paid their last respects at Hani’s house. Among them were fellow movie and television actors who had worked with Hani all these years. Hani was buried beside the grave of his mother Hasni Bakar at the Hulu Kelang Muslim cemetery. In Kangar, Hani’s aunt Hasnu Bakar said Hani was looking forward to her making his favourite ketam masak gulai lemak (crab in coconut milk stew). “I told him I would prepare it today (yesterday). My husband had already ordered the crabs,” she said at her home in Taman Sena here yesterday. Hani had planned to stop over at her house for lunch before taking a ferry to Langkawi for a holiday with Hani Karmila.